Truking and Romaco, the Chinese pharmaceutical group and its European subsidiary, are planning to share a booth at this year’s Pharmintech. Truking will take advantage of the upcoming Pharmintech to present the latest model in its Smart Filling series KGSB2. This compact line is used to fill and freeze-dry sterile pharmaceutical liquids. With a maximum output of 50 vials per minute, the technology is predestined for manufacturing pilot batches, for example for clinical studies. 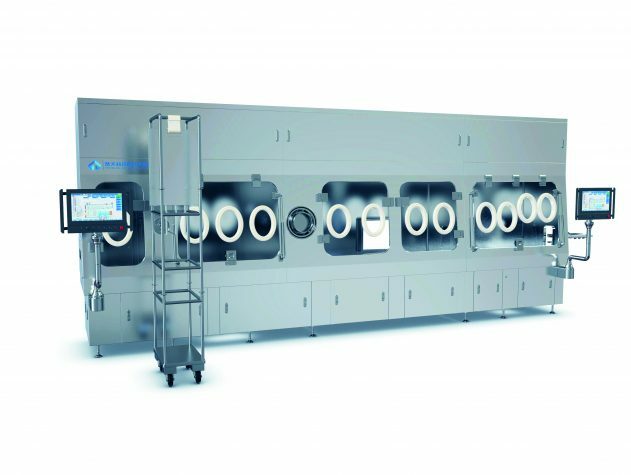 The machine is equipped with Truking isolator technology and combines four process steps: filling the vials, stoppering, freeze-drying and sealing with caps. The ZG2 capping machine has a width of just 800 mm and a very small footprint. The user friendly design simultaneously ensures good access to all components, speeding up format and product changes. Truking’s fully automated Smart Filling series particularly impresses with its linear, modular architecture. Particle-free transfer systems guide the vials safely through the production process even when space is restricted. Truking follows an application focused strategy throughout when designing the isolators in its LALUTK series. Ergonomic aspects, too, play an important role. These high containment systems undergo realistic trials in the laboratory in Changsha before being put into operation. Amongst other things, the functionality of glove boxes, rapid transfer port systems, nozzles and doors can be tested in this way under real conditions. The components are then configured and positioned accordingly. The concentration of particles in the isolator is likewise systematically monitored. Potential contamination sources can thus be identified and removed immediately. Truking isolators are fitted with VHP generators and sterilized using the dry H2O2 method. The hydrogen peroxide concentration is kept below the saturation level during the decontamination phase, to prevent the steam from condensing. The VHP method offers excellent material compatibility and is easy to validate. Both the biological activity and the distribution of the evaporated H2O2 can be verified according to GMP. Romaco, the Truking subsidiary, will be joining the parent company at Pharmintech to demonstrate secondary and final packaging solutions for seamless track & trace. The firm’s Promatic technologies provide a flexibly configurable platform for serializing and aggregating pharmaceutical packaging. The Promatic PCI 915 intermittent motion cartoner will be on show in line with a Promatic PTT 250 track & trace machine and a PAK 130 case packer. The Romaco exhibit will also include a processing machine in the Innojet VENTILUS V 5 series.